"STEREO satellite" redirects here. For the musical ensemble, see Stereo Satellite. This article is about the NASA spacecraft. For other uses of "Stereo", see Stereo (disambiguation). STEREO (Solar Terrestrial Relations Observatory) is a solar observation mission. Two nearly identical spacecraft were launched in 2006 into orbits around the Sun that cause them to respectively pull farther ahead of and fall gradually behind the Earth. This enables stereoscopic imaging of the Sun and solar phenomena, such as coronal mass ejections. This introductory video demonstrates STEREO's locations and shows a simultaneous image of the entire Sun. The two STEREO spacecraft were launched at 00:52 UTC on October 26, 2006, from Launch Pad 17B at the Cape Canaveral Air Force Station in Florida on a Delta II 7925-10L launcher into highly elliptical geocentric orbits. The apogee reached the Moon's orbit. On December 15, 2006, on the fifth orbit, the pair swung by the Moon for a gravity assist. Because the two spacecraft were in slightly different orbits, the "ahead" (A) spacecraft was ejected to a heliocentric orbit inside Earth's orbit while the "behind" (B) spacecraft remained temporarily in a high Earth orbit. The B spacecraft encountered the Moon again on the same orbital revolution on January 21, 2007, being ejected from Earth orbit in the opposite direction from spacecraft A. Spacecraft B entered a heliocentric orbit outside the Earth's orbit. Spacecraft A will take 347 days to complete one revolution of the Sun and Spacecraft B will take 387 days. The A spacecraft/Sun/Earth angle will increase at 21.650 degree/year. The B spacecraft/Sun/Earth angle will change −21.999 degrees per year. Given that the length of Earth's orbit is around 940 million kilometres, both craft have an average speed, in a rotating geocentric frame of reference in which the sun is always in the same direction, of about 1.8 km/s, but the speed varies considerably depending on how close they are to their respective aphelion or perihelion (as well as on the position of Earth). Their current locations are shown here. Over time, the STEREO spacecraft will continue to separate from each other at a combined rate of approximately 44 degrees per year. There are no final positions for the spacecraft. They achieved 90 degrees separation on January 24, 2009, a condition known as quadrature. This is of interest because the mass ejections seen from the side on the limb by one spacecraft can potentially be observed by the in situ particle experiments of the other spacecraft. As they passed through Earth's Lagrangian points L4 and L5, in late 2009, they searched for Lagrangian (trojan) asteroids. On February 6, 2011, the two spacecraft were exactly 180 degrees apart from each other, allowing the entire Sun to be seen at once for the first time. Even as the angle increases, the addition of an Earth-based view, e.g., from the Solar Dynamics Observatory, will still provide full-Sun observations for several years. In 2015, contact was lost for several months when the STEREO spacecraft passed behind the Sun. They will then start to approach Earth again, with closest approach sometime in 2023. They will not be recaptured into Earth orbit. On October 1, 2014, contact was lost with STEREO-B during a planned reset to test the craft's automation, in anticipation of the aforementioned solar "conjunction" period. The team originally thought the spacecraft had begun to spin, decreasing the amount of power that could be generated by the solar panels. NASA used its Deep Space Network, first weekly and later monthly, to try to re-establish communications. After a silence of 22 months, contact was regained at 22:27 UTC on August 21, 2016, when the Deep Space Network established a lock on STEREO-B for 2.4 hours. Later analysis of the received telemetry concluded that the spacecraft was in an uncontrolled spin of about three degrees per second; this was too rapid to be immediately corrected using its reaction wheels, which would become oversaturated. Engineers planned to work and develop software to fix the spacecraft, but once its computer was powered up there would only have been about two minutes to upload the fix before STEREO-B entered failure mode again. Further, while the spacecraft was power positive at the time of contact, its orientation would drift and power levels fall. Six attempts at communication between September 27 and October 9, 2016, failed, and a carrier wave has not been detected since September 23. Four years after the initial loss of contact, NASA terminated periodic recovery operations effective October 17, 2018. The principal benefit of the mission is stereoscopic images of the Sun. In other words, because the satellites are at different points along the Earth's orbit, but distant from the Earth, they can photograph parts of the Sun that are not visible from the Earth. This permits NASA scientists to directly monitor the far side of the Sun, instead of inferring the activity on the far side from data that can be gleaned from Earth's view of the Sun. The STEREO satellites principally monitor the far side for coronal mass ejections — massive bursts of solar wind, solar plasma, and magnetic fields that are sometimes ejected into space. Since the radiation from coronal mass ejections, or CMEs, can disrupt Earth's communications, airlines, power grids, and satellites, more accurate forecasting of CMEs has the potential to provide greater warning to operators of these services. Before STEREO, the detection of the sunspots that are associated with CMEs on the far side of the Sun was only possible using helioseismology, which only provides low-resolution maps of the activity on the far side of the Sun. Since the Sun rotates every 25 days, detail on the far side was invisible to Earth for days at a time before STEREO. The period that the Sun's far side was previously invisible was a principal reason for the STEREO mission. STEREO program scientist Madhulika Guhathakurta expects "great advances" in theoretical solar physics and space weather forecasting with the advent of constant 360-degree views of the Sun. STEREO's observations are already being incorporated into forecasts of solar activity for airlines, power companies, satellite operators, and others. STEREO has also been used to discover 122 eclipsing binaries and study hundreds more variable stars. STEREO can look at the same star for up to 20 days. On July 23, 2012, STEREO-A was in the path of the solar storm of 2012 which was similar in strength to the Carrington Event. Its instrumentation was able to collect and relay a significant amount of data about the event. STEREO-A was not harmed by the solar storm. Sun Earth Connection Coronal and Heliospheric Investigation (SECCHI) has five cameras: an extreme ultraviolet imager (EUVI) and two white-light coronagraphs (COR1 and COR2). These three telescopes are collectively known as the Sun Centered Instrument Package or SCIP, and image the solar disk and the inner and outer corona. Two additional telescopes, heliospheric imagers (called the HI1 and HI2) image the space between Sun and Earth. The purpose of SECCHI is to study the 3-D evolution of coronal mass ejections through their full journey from the Sun's surface through the corona and interplanetary medium to their impact at Earth. In-situ Measurements of Particles and CME Transients (IMPACT) will study energetic particles, the three-dimensional distribution of solar wind electrons and interplanetary magnetic field. PLAsma and SupraThermal Ion Composition (PLASTIC) will study the plasma characteristics of protons, alpha particles and heavy ions. STEREO/WAVES (SWAVES) is a radio burst tracker that will study radio disturbances traveling from the Sun to the orbit of Earth. Each STEREO spacecraft had a dry mass of 547 kg (1,206 lb) and a launch mass of 619 kg (1,364 lb). In their stowed configuration, each had a length, width and height of 2.0 × 1.2 × 1.1 m (6.67 × 4.00 × 3.75 ft). Upon solar array deployment, its width increased to 6.5 m (21.24 ft). With all of its instrument booms and antennae deployed, its dimensions are 7.5 × 8.7 × 5.9 m (24.5 × 28.6 × 19.2 ft). The solar panels can produce an average of 596 watts of power, and the spacecraft consumes an average of 475 watts. The STEREO spacecraft are 3-axis stabilized, and each has a primary and backup miniature inertial measurement unit (MIMU) provided by Honeywell. These measure changes to a spacecraft's attitude, and each MIMU contains three ring laser gyroscopes to detect angular changes. Additional attitude information is provided by the star tracker and the SECCHI Guide Telescope. STEREO's onboard computer systems are based on the Integrated Electronics Module (IEM), a device that combines core avionics in a single box. Each single-string spacecraft carries two CPUs, one for command-and-data handling and one for guidance and control. Both are radiation hardened 25 megahertz IBM RAD6000 processors, based on POWER1 CPUs (predecessor of the PowerPC chip found in older Macintoshes). The computers, slow by current personal computer standards, are typical for the radiation requirements needed on the STEREO mission. STEREO also carries Actel FPGAs that use triple modular redundancy for radiation hardening. The FPGAs hold the P24 MISC and CPU24 soft microprocessors. For data storage, each spacecraft carries a solid state recorder able to store up to one gigabyte each. 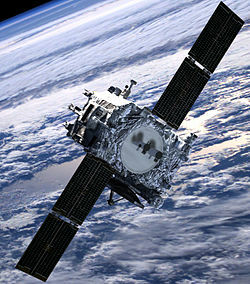 Its main processor collects and stores on the recorder images and other data from STEREO's instruments, which can then be sent back to Earth. The spacecraft have an X-band downlink capacity of between 427 and 750 kbps. A lunar transit of the Sun captured during calibration of STEREO-B's ultraviolet imaging cameras. The Moon appears much smaller than it does from Earth, because the spacecraft-Moon separation was several times greater than the Earth-Moon distance. The Sun's South Pole. Material can be seen erupting off the Sun in the lower right side of the image. For STEREO's 10th anniversary, Deputy Project Scientist Terry Kucera gives an overview of the mission's top 5 success stories. Advanced Composition Explorer (ACE), launched 1997, still operational as of January 2019[update]. Solar Orbiter (SOLO), set to launch in February 2020. Parker Solar Probe, launched August 2018. Wind (spacecraft), launched 1994, still operational as of January 2019[update]. ^ "NASA Launch Schedule". NASA. September 20, 2006. Retrieved September 20, 2006. ^ Zell, Holly, ed. (February 6, 2011). "First Ever STEREO Images of the Entire Sun". NASA. ^ a b c Sarah, Frazier (December 11, 2015). "Saving STEREO-B: The 189-million-mile Road to Recovery". NASA. ^ Fox, Karen C. (August 22, 2016). "NASA Reestablishes Contact with STEREO Mission". NASA. Retrieved August 22, 2016. ^ a b c d "What's New". STEREO Science Center. NASA. October 11, 2016. Archived from the original on October 23, 2016. ^ Geldzahler, Barry; et al. (2017). A Phased Array of Widely Separated Antennas for Space Communication and Planetary Radar (PDF). Advanced Maui Optical and Space Surveillance Technologies Conference. September 19-22, 2017. Wailea, Maui, Hawaii. pp. 13–14. Bibcode:2017amos.confE..82G. ^ Mosher, Dave (August 23, 2016). "NASA may have less than 2 minutes to rescue its long-lost spacecraft". Business Insider. Retrieved August 24, 2016. ^ Kucera, Therese A., ed. (October 23, 2018). "STEREO-B Status Update". NASA/STEREO Science Center. Retrieved February 26, 2019. ^ a b "Sun bares all for twin space probes". CBC News. February 7, 2011. Retrieved February 8, 2011. ^ Lemonick, Michael (February 6, 2011). "NASA Images the Entire Sun, Far Side and All". Time. Retrieved February 8, 2011. ^ Winter, Michael (February 7, 2011). "Sun shines in twin probes' first 360-degree images". USA Today. Retrieved February 8, 2011. ^ "Stereo satellites move either side of Sun". BBC News. February 6, 2011. Retrieved February 8, 2011. ^ a b "STEREO turns its steady gaze on variable stars". Astronomy. Royal Astronomical Society. April 19, 2011. Retrieved April 19, 2011. ^ "Near Miss: The Solar Superstorm of July 2012". NASA. July 23, 2014. Retrieved July 24, 2014. ^ a b c d "STEREO Spacecraft & Instruments". NASA. March 8, 2006. Retrieved May 30, 2006. ^ Howard, R. A.; Moses, J. D.; Socker, D. G.; Dere, K. P.; Cook, J. W. (June 2002). "Sun Earth Connection Coronal and Heliospheric Investigation (SECCHI)". Advances in Space Research. 29 (12): 2017–2026. Bibcode:2002AdSpR..29.2017H. doi:10.1016/S0273-1177(02)00147-3. ^ Luhmann, J. G.; Curtis, D. W.; Lin, R. P.; Larson, D.; Schroeder, P.; et al. (2005). "IMPACT: Science goals and firsts with STEREO". Advances in Space Research. 36 (8): 1534–1543. Bibcode:2005AdSpR..36.1534L. doi:10.1016/j.asr.2005.03.033. ^ a b c Gurman, Joseph B., ed. (2007). "STEREO Spacecraft". NASA/Goddard Space Flight Center. Retrieved August 22, 2016. ^ a b c "STEREO - Solar TErrestrial RElations Observatory" (PDF). NASA. 2005. NP-2005-8-712-GSFC. Retrieved August 22, 2016. ^ Beisser, Kerri (ed.). "STEREO - Characteristics". Applied Physics Laboratory. Retrieved August 22, 2016. ^ "Honeywell To Provide Miniature Inertial Measurement Units For STEREO Spacecraft". Honeywell International. Archived from the original on November 25, 2005. Retrieved October 25, 2006. ^ Driesman, Andrew; Hynes, Shane; Cancro, George (April 2008). "The STEREO Observatory". Space Science Reviews. 136 (1): 17–44. Bibcode:2008SSRv..136...17D. doi:10.1007/s11214-007-9286-z. ^ Mewaldt, R. A.; Cohen, C. M. S.; Cook, W. R.; Cummings, A. C.; Davis, A. J.; et al. (April 2008). "The Low-Energy Telescope (LET) and SEP Central Electronics for the STEREO Mission" (PDF). Space Science Reviews. 136 (1): 285–362. Bibcode:2008SSRv..136..285M. CiteSeerX 10.1.1.459.4982. doi:10.1007/s11214-007-9288-x. Wikimedia Commons has media related to STEREO. This page was last edited on 27 February 2019, at 06:48 (UTC).